There's something particularly satisfying about a modern film shot in an anachronistic style. Canadian filmmaker Guy Maddin has made a career of it. One of his recent films, a travelogue "documentary" about Winnipeg, is no different. It's a surreal black and white exploration of the sort of impressionist filmmaking that went out of style with the talkies. "My Winnipeg" particularly resonated with me, because it's about feeling trapped in a provincial town that is almost by definition dull, yet trying to find the hidden wonder in something that is small and everyday and very, very familiar. Guy Maddin talks about the ghost Winnipeg, the city that lies beneath the real city and has been there since the time of the Indians and the fur trappers. I had a similar notion about Madison when I lived there, that there was a counter-Madison that intersected the real Madison in out of the way corners of certain parks late at night. But even in the dullest of towns, amazing things happen from time to time. This was another tip from the inestimable Lawrence Person , who mentioned it on the steampunk panel we did together. 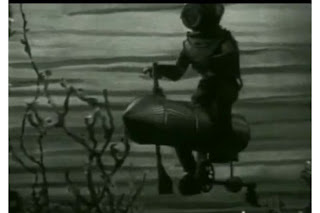 It's a Czech movie, because nobody makes weird animation quite like the Czech. The titles claim it was filmed in "Mysti-Vision". 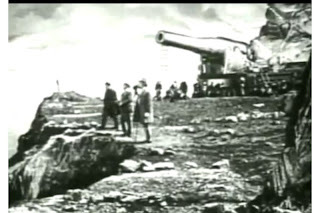 Which means that despite being filmed in the 1950s, it looks like a nineteenth century print plate come to life. It's based on the Jules Verne novel Facing the Flag that most people haven't heard of, because it seems like a rip-off of 20,000 Leagues Under the Sea, and it's apparently quite jingoistic. I found a youtube channel that has the whole film posted, which doesn't give the images the sort of resolution they deserve, but it gives a hint of how amazing they are. D'Hanis is a small town about an hour's drive west of San Antonio. Technically, it's "new" D'Hanis because the entire town was moved several miles west in 1914. There's not a lot to see in "new" D'Hanis, and even less of "old" D'Hanis... with one exception. 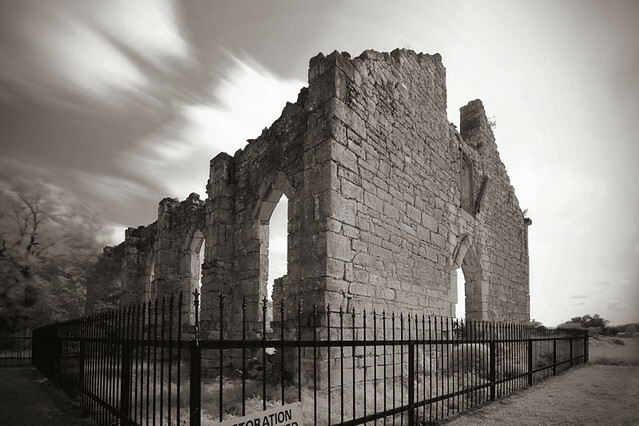 St. Dominic Church was built in 1853 and later abandoned in 1914 after the town relocated. It has since fallen into ruin. And what elegant, lovely ruins they are. There's a certain romance to ruins. Maybe they give a place a sense of history--the U.S. is a relatively young country, so we don't have anything comparable to the Roman Coliseum or Greek amphitheaters or Mayan temples. Filling that role for us are old Spanish missions and crumbling churches, which, once you get down to it, have a unique feral beauty all their own. 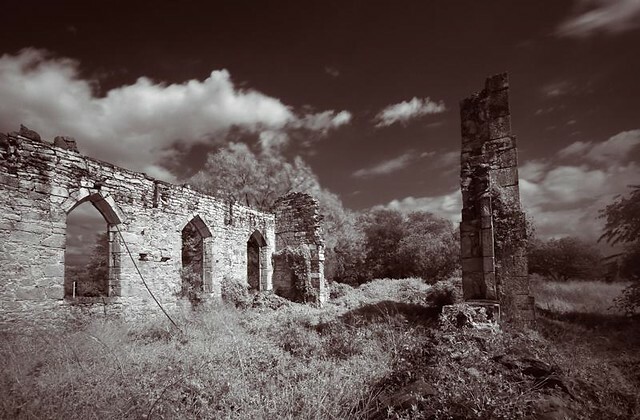 St. Dominic is certainly a fine example of a beautiful ruin. I occasionally assist The Wife with photography, and a little side obsession of mine is infrared photography--shooting in a way that blocks visible light to reveal the unseen world illuminated by the near-infrared part of the spectrum. It's been a while since I photographed anything in infrared, but I knew I wanted to try here, since infrared light can bring out details hidden otherwise. Since my camera isn't converted, I had to set up the tripod, compose and focus the image then thread the visible light-blocking filter onto the end on the lens. This takes up a lot more time than you'd imagine. Once all of that is complete, I remotely trigger the camera for a pre-set exposure lasting anywhere from 5 to 20 seconds. Because of the blocking filter, exposures must be very long to ensure an image is formed. Compounding the challenge was the wind--it was gusty like you wouldn't believe. That shakes the camera, which blurs the long-exposure image. At the end of the day, I had far too many wasted shots. But I had a few keepers, too. 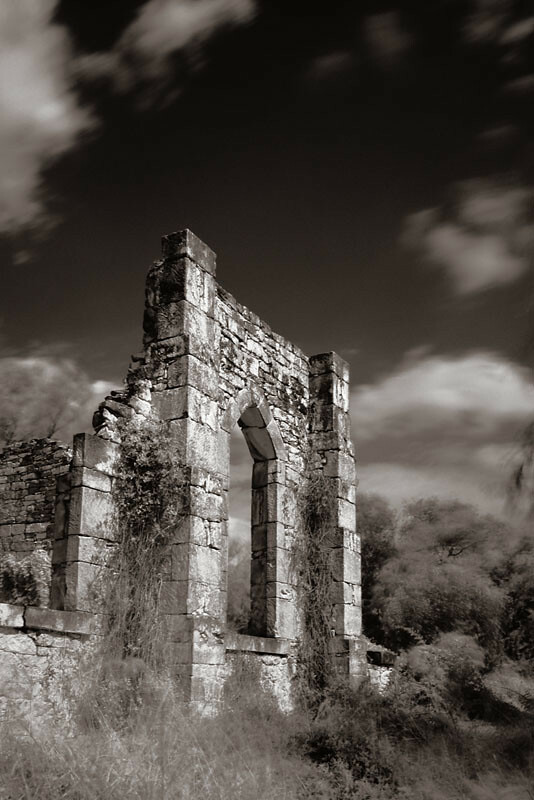 Unlike shooting with infrared film (which is challenging in its own right) most of the work on the image takes place after the fact with digital. Unprocessed infrared images are muddy, reddish things that are pretty ugly. I spent about an hour in Photoshop for each of the above, trying different things to bring out the most in each shot--experimenting is part of the fun! The top and bottom shots are different variations on a duotone process, while the middle image is a tritone process--which is a fancy way of saying multiple colors are used to create a warmer, richer black-and-white image than could be achieved using only black and white. I'd forgotten how much I love infrared. I'm going to make it a point to make a few more photo excursions while the autumn light is still good. Can One Man Change the World? The latest entry in my ever-expanding "How could I have never heard of this before?" sweepstakes is found in Sarah Rose's For All the Tea in China: How England Stole the World's Favorite Drink and Changed History. For two centuries, Britain raised poppies in India, which it then converted to opium and sold/traded to China for tea. When China threatened to lift the ban and grow its own opium, Britain decided to grow its own tea (it had an excellent place to do so in the mountains of Tibet). There was just one tiny problem. Britain had no tea plants, nor any knowledge of how to grow, tend, and harvest tea. If they were going to wrest control of tea from the Chinese, they would need some help. They would need a plant hunter, a botanist, a gardener, a thief, a spy. They would need someone capable of disguising himself as Chinese, as Westerners were not welcome in China. They would need someone capable of dealing with everyone from corrupt Mandarins to common folk to pirates. They found Robert Fortune, whose efforts reshaped the world's economy. Let's get this out of the way first, Enthiran: The Robot is not Bollywood. This is a Tamil-language movie with Tamil stars. So I'll be using the term Bollywood to refer to the Mumbai-based Hindi film industry, and Indian cinema for the shared culture of Bollywood and Tamil film. Also, if you're planning on seeing Enthiran: The Robot on the big screen (which is really the only way to see it), it's still playing in American theaters. A matinee here in Austin will cost you $18, but I assure you it is worth every last penny (last week there was a dubbed Hindi version which only cost $12, but you want to hear it in the original Tamil, don't you?). Considering that Robot is three hours long, think of it as getting two thrilling sci-fi movies for the price of one. But Koi... Mil Gaya and it's sequel, Krrish, did well, which proved that it wasn't impossible to make commercially successful Indian sci-fi. Perhaps the lesson that Enthiran: The Robot took from those movies is you have to include a super hero power fantasy. The first half of Robot is nothing but the robot displaying ridiculous go-go gadget style powers. He beats up bullies, saves people from burning buildings, talks to mosquitoes (really), and in general acts like a robotic E.T. That is until the second half of this three-hour movie, when the robot undergoes a character inversion that won't surprise anyone with even a passing familiarity with Indian classical literature. The previously cute robot shows how its super powers are actually the basis for the most terrifying vision of the singularity in recent memory. The musical sequences of Robot take full advantage of the science fiction premise. We get electro-bhangra beats with vocoder Tamil rap. The dance sequences feature the flashiest of futuristic metallic headgear. Except notably the Kilimanjaro song, which is inexplicably filmed on location in Machu Picchu, with backup dancers wearing the sorts of traditional costumes the Incas would have worn if their entire empire was contained within the Vegas Strip. Super Star Rajni (AKA Rajinikanth) carries this film with his cool, playing both the robot and its creator (your classic Indian cinema dual role). Super Star Rajni's success is based on a particular grinning strut, a Rick Perry coif (a wig apparently), and some of the best karate in Indian cinema. He is one of those Asian actors who has the reputation of being the biggest star you never heard of. We've seen the pattern with Hong Kong actors, where a star like Jackie Chan or Chow Yun-Fat builds a career over decades, but never successfully ports to the English-language market. If you miss this Tamil version of the future, you still have the chance to catch Super Star Rajni's CGI animated vehicle, Sultan the Warrior. Coming soon to an international cinema near you. Considering that I edit three different short fiction venues, it might seem a little odd how rarely I read short fiction outside the slushpile. But I spent this afternoon reading the recent novella by Ted Chiang, "The Lifecycle of Software Objects," which is out in the current Subterranean Press. Like most of Ted Chiang's work it is dense, pedantic, and meticulously analytical. It is also about 30k words long, which means about two hours of delicately scrolling the browser page. But a well-spent two hours it was. At issue with "The Lifecycle of Software Objects" is the banality of artificial intelligence and the tedium of child-rearing. We're used to the following structure for AI stories: mumbo-jumbo plus processing power leads to digital super-intellects, culminating in world-altering drama. This story, for all its insights into the development of intellect, follows a far more personal scope. And somehow feels all the more epic for having done so. I've been thinking a lot about the value of short fiction, both as an editor and as a writer. It seems that even the good fiction comes in only two flavors: light and heavy. Ted Chiang is the poster-boy for heavy spec fic. It reminds me of what Cait Coker said about John Campbell and the golden-age crew coming into the spotlight after Hiroshima. Their short fiction had been processing the elements of the future for a long time, so they were the only ones not surprised by the man-made sun over Japan. 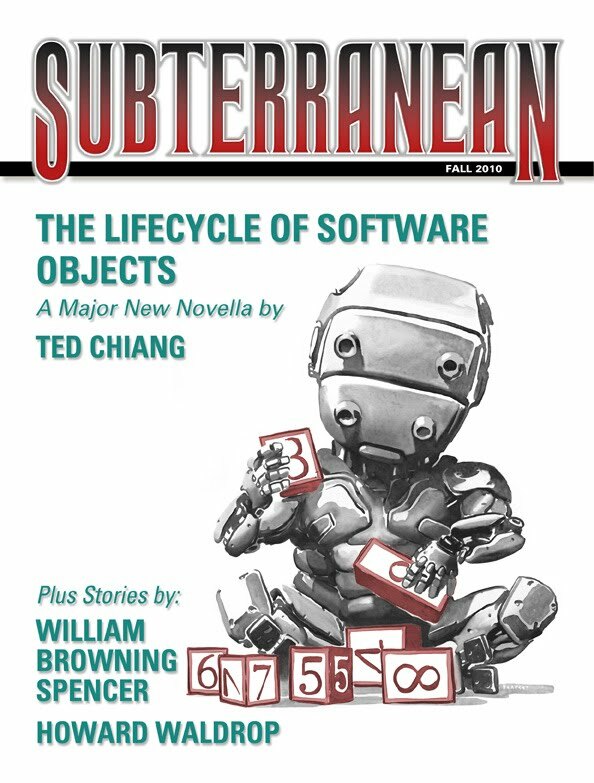 "The Lifecycle of Software Objects" is that sort of story. It's our first glimpse of wonders that will be built in increments through the labor of everyday life. 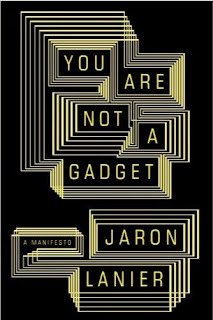 “Jaron Lanier, 49, is many things — composer, performer, computer scientist, philosopher — but one thing he is not is a machine. 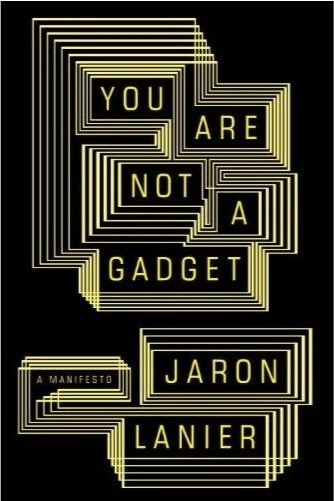 His book You Are Not a Gadget, published this year, compels readers to take a fresh look at the power — and limitations — of human interaction in a socially networked world. ” – Dan Reed in Time Magazine’s 2010 list of 100 people who most effect our world. This is an amazing book. Lanier, of Virtual Reality fame, slams a) the rampant digitization of everything; b) the quasi-religious impulse on the part of some digerati to anticipate a Rapture-like upload of human minds into digital existence; c) the open, information-wants-to-be-free approach to creativity, along with the popularity of mashing up existing creative artifacts – books, movies, photos – into new, derivative works; d) Google’s goal of digitizing every book it can grab, e) Net anonymity that breeds trollishness, and f) numerous other errors and sins of computer culture. Along the way he debunks the idea that creators can make a living with digital distribution. He did a survey of musicians and found precious few who made any kind of money with digital distribution! This does not bode well for authors. At the same time, Lanier has insightful, occasionally wistful, hopeful, and profound observations about technology and life. The book transcends screed. It’s one to read and heed. I scanned some of You Are Not A Gadget into Word to put a few of Lanier’s choicest pages into my files for further study and easily quote a paragraph elsewhere, like here. The scanner I used is a wonderful piece of tech: it readily scans books and magazines and converts them into PDF, Word, jpeg, or tiff, and you can e-mail the results to yourself by touching your e-mail address into an alphabet touch screen or save to flash drive. The scanner is a good instance of digital technology being highly and almost magically useful. Over on my Livejournal, I've been running some excerpts from Stella Dong's splendid Shanghai: The Rise and Fall of the Decadent City. (To indifferent response, I should add. Too long, I guess). The following are two of the shorter excerpts, which I'm posting here because the Shantung Monster is the classic historical-person-who-reads-like-he's-from-a-pulp-story, and because the declaration of war is about the best phrased declaration in the history of history. A warlord of an entirely different sort, and one with whom the Green Gang leaders would find an instant affinity, was the Shantung's gargantuan, shaven-headed, illiterate Chang Tsung-chang, whose sixty-thousand-man army of Shantung soldiers augmented by a contingent of White Russian army recruits next swept into Shanghai. The six-foot-seven "Shantung monster" had fought his way up from poverty by working in gambling dens in his native Shantung. The son of a witch and a trumpet player, Chang was the most feared and rapacious of the warlords. Critics were instantly executed, and he encouraged his men to hang the severed heads of their victims--"open melons," they called them--from telegraph poles throughout the province as an advertisement of their abilities. Chang Tsung-chang smoked only the biggest and most expensive Manila cigars and traveled everywhere with his enormous lacquered teak coffin. Notoriously fond of food and pleasures of the flesh, the Shantung behemoth consumed huge amounts of food, which he washed down with brandy and champagne, and maintained a harem of some three dozen Chinese and international beauties to which he was always adding new recruits--each of the foreign members of the seraglio was provided a washbowl with the flag of her country painted on its side. "Chang Tsung-chang" is the Wade-Giles romanization of Zhang Zongchang, who will forever be known as the "Dogmeat General." You can find out much more about him in the splendid Osprey Chinese Warlord Armies, 1911-30.
the most intense fighting yet around Shanghai, as rivalry among Kiangsu and Chekiang warlords for control of Shanghai's opium revenues reached such a pitch that the struggle was dubbed the "opium war." The Kiangsu warlord Chi Shi-yuan, a classicist with a small face and wispy mustache who spent hours perfecting his calligraphic style, started the conflict in September 1924 by declaring war against Lu Yung-hsiang with the following public statement: "I have a beautiful Sung vase, a precious thing which it would be sacrilegious to break. Inside the vase, a rat keeps climbing to the top and sticking out its head. Now I would dearly like to catch that rat and kill it, but I might break the vase. That would be a calamity. Yet, if I turn the vase upside down, the rat will run out and I can kill it. That is what I am going to do." Chi fought Lu to a standstill, but the Dogmeat General arrived, beat his army, and sent him fleeing to Japan. Subtitled What the Internet Is Doing to Our Brains, this is an emphatic book – not quite strident, but assertively thought-provoking. It insists that computers and the Internet undermine the human mind’s ability – hard won ever since the advent of the printing press and wide-spread literacy – to pay deep and reflective attention. Nicholas Carr's thesis may be overstated, especially in attributing deep, sustained, and reflective attention primarily to reading. After all, native peoples with oral traditions, craftsmen, and ascetics have always practiced intense attention. But I think Carr is right when he says that computers and especially Web surfing have a destructive effect on attention. He laments the “permanent state of distractedness that defines the online life.” He’s right about that! He accuses the Net of being a nexus of ‘interruption technologies’.” I can’t quibble with that assessment. I’ve watched myself flit around the Net and respond to e-mails that interrupt excursions on the Net that have interrupted something I should be concentrating on…. Carr’s provocative book has me re-examining my Net habits. Fortunately, I’ve never fallen into the habit of Net-surfing while writing, and I’m not going to let that camel get its nose in the tent of my vocation.